Designs by Lisa Somerville: Artistic Outpost has a new look...and some savings too! Artistic Outpost has a new look...and some savings too! Artistic Outpost has a FRESH new look, the new website is up and running! There's a new shopping cart feature which now has the capability to accept special Discount Codes, and a beautiful new gallery! To celebrate here's a special Artistic Outpost Discount Code you can use to save 10% when shopping the Artistic Outpost Store just enter LS-10off in the discount box and hit apply before checking out. Note this coupon code doesn't expire - so feel free to use it anytime you place your order. I created this card using the sketch found here and the Bingo Blast Technique from the TJNL. The Bingo Blast done in Red and Blue reminds me of Fireworks and I thought it was perfect to use with the Artisic Outpost Hero Plate. For the Bingo Blast, I used Adirondack Paint Daubers. I did get the empty bingo daubers I ordered from OT the other day, and tried them with a mixture of Distress Reinker, Perfect Pearls, Water and Rubbing Alcohol, but the daubers are a bit small and the mixture was a tad too light for my liking. Once my Bingo Blast was try (I zapped it with the heat gun), I cut it with Nesities and layered it onto a Blue Scallop. The image from the Hero Plate is stamped in Black Archival on watercolor paper, then colored with Distress Inks and an aquapainter. The sentiment (also from this plate) was stamped in Black on Red card stock, then ran through the Big Shot using the Distressed Stripes Embossing Folder. ETA - I've had a few people email to say they are having issues with the new AO site, the new site is in greens/browns, if the old site comes up (it's got a black background), you'll want to try clearing your Cache, or enter the site using Internet Explorer. 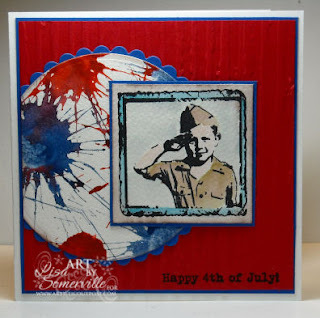 I LOVE your card---great for the upcoming Memorial Day later this month. Ok just had to order 2 sets---liked the one you used alot but decided to go with Keeper & the Route 66 set. Thanks much for the coupon code!